The emails - scanned and arranged in chronological order. The original scanned emails from EHDC . 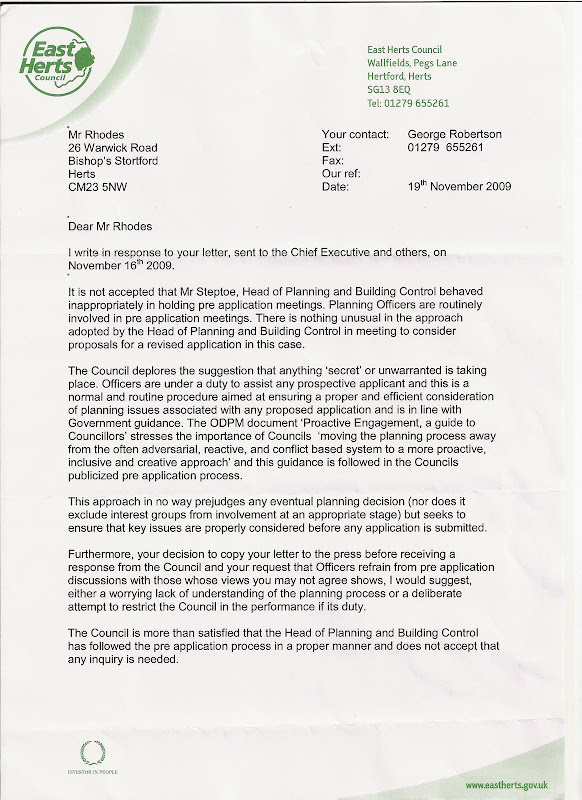 I am writing on behalf of the Bishop's Stortford Civic Federation to ask you to review the conduct of EHDC's Head of Planning and Building Control, Mr Kevin Steptoe, during the course of 2009, as disclosed in the exchanges of emails with Messrs Vincent and Gorbing. The subject matter of the exchanges concerns proposals by two foundation schools in Bishop's Stortford to relocate to a Green Belt site on the edge of town and to fund the move by redeveloping their existing sites for housing together with one acquired by the County Council for educational purposes some 30 years ago. The emails have been disclosed in response to a Freedom of Information Act inquiry together with confirmation that four meetings have taken place between planning officers and the scheme promoters about which no records have been kept by officers. Planning applications for all these sites were withdrawn by the applicants a year ago, following recommendations by planning officers that permission be refused. Prior to that, in April 2007, EHDC, by direction of the Inspector, adopted the local plan which maintains the designation of the whole of the relocation site in Whittington Way Map as Green Belt (overruling attempts by the schools and developers to redesignate some or all of it). She also required the County Council's site at Hadham Road to be retained for educational purposes unless and until some alternative way of meeting the town's shortfall in secondary school places was found. None of the other three affected sites were proposed for residential use or have even a conditional designation for an alternative to their present use in the local plan. In both national policy (PPG2) and in local planning policy there is an overwhelming presumption against development of Green Belt land. No proposals for relocating the two schools to Whittington Way could comply with this policy or with the local plan, given that an alternative site in County Council ownership has long been available to meet the acute and growing shortage of secondary school places in Bishop's Stortford. Implementing the relocation would lead to the existing schools sites being redeveloped for housing, for which they have no such designation in the local plan. The scheme promoters have now failed twice, through the adoption process for the local plan, and through the local planning application process, to achieve any recommendation in favour of granting permission for their proposals. Implementing them would involve four major departures from the local plan and the overturning of Green Belt protection policy. Moreover, the proposals published last year generated an unprecedented level of opposition from local residents with nearly four thousand signatories petitioning against them, and nearly one thousand letters of objection against the planning applications themselves, as well as opposition from the CPRE. The clearly expressed wish of local people is for an additional school – not for enlarged versions of the existing schools relocated to a common site on the periphery of the town. In the light of this history, I would have expected that the planning department would have made it clear to the scheme promoters that no variation of their proposals on the same site had the slightest chance of being granted planning permission by EHDC and that they should look for an alternative way of meeting the need for additional school places which was consistent with the local plan and the wishes of local residents. The contents of Mr Steptoe's emails to Messrs Vincent and Gorbing therefore come as a considerable surprise. In his email of 2 February, his précis of the reasons for recommending refusal of the previous applications is an inaccurate and incomplete summary of the conclusions of the reports to the Development Control Committee which he presumably co-authored. His conclusion that we are able to work constructively with the team promoting these proposals appears to disregard completely the policies for Bishop's Stortford embodied in the local plan. His comment that this Council has moved further forward in relation to the release of the ASR sites to the North of the town and that planning officers are in dialogue with landowners and developers about the process for bringing this land forward for development will be news to local residents. The ability of these sites to accommodate sustainable development and the capability of the town to absorb further major population growth have not been demonstrated, and the state of the housing market, with phase 1 sites in the local plan not yet exploited, suggest that there is no urgency which could possibly justify such negotiations. In any case, it is clear from the email correspondence that the scheme promoters have no interest in the ASR's even though the Hadham Road site can accommodate a 6 forms of entry school and is immediately adjacent to them. Mr Steptoe's statements in his email of 2 June that we are keen to assist/be involved/work with you to avoid a situation where we could not support any scheme and email of 14 August that I had hoped that…we could work jointly toward a new scheme appear to be completely indefensible. They seem to show the EHDC planning department actively colluding in private with the scheme promoters to bring forward proposals whose aim and effect would be to undermine key aspects of the local plan as it applies to Bishop's Stortford. People who move to Bishop's Stortford rely on the local plan to inform them of the location of schools and of any development proposals. I trust that EHDC has taken account of its exposure to legal action if it transpires that, as a result of these negotiations with the scheme promoters, it has been giving what may turn out to be misleading and inaccurate replies to local search inquiries. Mr Steptoe's conduct in this matter does not appear to be compatible with EHDC's published planning policies for Bishop's Stortford. While I appreciate that the provision of school places is not a matter for EHDC, their location certainly is. The Bishop's Stortford Civic Federation has demonstrated in relation to the previous applications that the shortage of school places for year 7 admission to secondary schools was between one and three forms of entry in 2007 and 2008. The data for 2009 suggest that the problem is getting worse. Had it not been for Birchwood school being persuaded to take a whole form of entry in excess of its published capacity of 8 forms of entry, there is every reason to suppose that the admissions procedure for Bishop's Stortford would have been overwhelmed by the demand. The result of Mr Steptoe's encouragement of an inappropriate solution (which would deliver only two additional forms of entry three to four years after scheme commencement) has been to delay by a further year a lasting and sustainable remedy for the shortfall in school places, which meets the wishes of parents to have their children educated locally. Would you please immediately instruct the officers in your planning department to have no further contact with the promoters of this proposal other than the formalities required by law. If, in complying with this instruction, any further meeting takes place between officers and the scheme promoters, officers should record a full note of the discussion. If Mr Steptoe was authorised to enter into the discussions referred to in these emails, I would like to know on whose authority he did so and how the Council's approval was obtained for that authority to be granted. If Mr Steptoe has been acting on his own initiative in this matter, I would respectfully suggest that he is assigned to other duties unrelated to planning and building control until such time as a thorough, open and independent investigation has been carried out into whether the conduct evidenced here is compatible with the proper discharge of his professional duties. Whatever the outcome of such an inquiry, I would respectfully suggest that Mr Steptoe's apparent encouragement of the submission of a fresh application should disqualify him from any role in evaluating it or advising the Development Control Committee should such a fresh application be submitted. I trust you will be able to give me that assurance. I appreciate that the Council's Monitoring Officer would normally be asked to investigate the issues raised in this letter. However, in view of the seriousness of the matters raised, and the fact that the Monitoring Officer is Mr Steptoe's line manager, I hope you will agree that it would be more appropriate for any investigation to be undertaken by yourself, as Head of the Paid Service. I should be obliged if you would treat this letter as a formal complaint. 1. Thank you for your letter of 19 November in reply to mine of 16 November to the Chief Executive about the conduct of the Head of Planning and Building Control in relation to proposals to relocate two schools to a Green Belt site to the south of Bishop's Stortford. I am sorry that you have neither understood the nature of the complaint I have made on behalf of the Bishop's Stortford Civic Federation nor answered any of the criticisms made in my letter. I shall therefore have to put the complaint to you again in terms to which I hope EHDC will now respond properly. 2. The Civic Federation is of course aware that planning officers hold pre application meetings with developers. However, it is not the fact that such meetings took place about which we are complaining, but what appears to have been discussed at those meetings, as disclosed by the material released by EHDC under the Freedom of Information Act. 4. The Government Guidance is addressed to Councillors. However, since you appear to be relying on it to justify the Council's conduct, we assume that its advice, where relevant, is equally applicable to officers. The Bishop's Stortford Civic Federation believe that the material disclosed under the Freedom of Information Act appears to show that a number of significant breaches of the Government Guidance have occurred. Our detailed reasoning is set out in the Annex to this letter. The Council's Code of Conduct for Officers does not appear to give any advice which is relevant to these issues. 5. The Civic Federation had asked for my previous letter to be treated as a formal complaint. You have not done so. We had suggested previously that since the Council's Monitoring Officer includes planning among his service delivery responsibilities, it might be invidious to ask him to carry out the investigation we had requested. 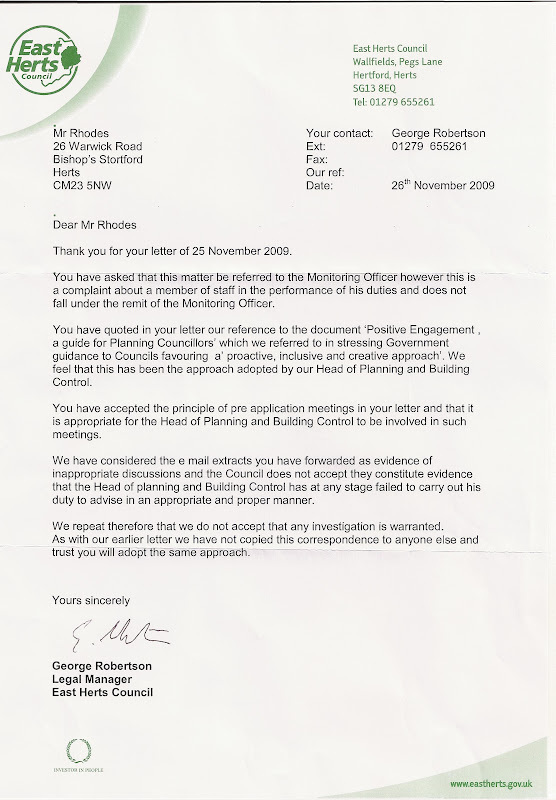 However, since it appears from your response that no formal investigation has taken place into our complaint, we would now be obliged if you would refer my previous letter, and this letter and attachment, which now form part of our complaint, to the Council’s Monitoring Officer for investigation as to whether the Head of Planning and Building Control has been discharging his statutory responsibilities in a lawful and proportionate way and has not taken action which would bring the Council, his post or profession into disrepute. 6. Until that investigation has been completed, we believe that our previous requests about limiting contact with the scheme's promoters, recording any discussion which does take place with them, and the deployment of the officer concerned remain entirely appropriate. 7. The Civic Federation remain committed to finding a solution to the shortage of secondary school places which respects the adopted local plan and can command the support of the whole community. We can see no justification for any officer of the Council pursuing a different objective. 8. You do not say to whom you have copied your letter. I am therefore giving your letter and this reply the same circulation as my previous letter. I am, in addition, sending a copy to the Council’s Monitoring Officer so that he may be aware of this formal request that he exercises his statutory functions. 'In summary then, I maintain the view that we are able to work constructively with the team promoting these proposals when we can see an opportunity to do so.' (We have noted that this email reserved the Council’s position). 'As you know we are keen to assist/ be involved/ work with you to avoid a situation where we could not support any scheme on the basis that we are not convinced by the environment that is being created. Do you think that the Inspire East offer is something that you/your clients would be willing to consider? We had hoped that it would not be necessary to emphasise to you again that the proposals about which the Head of Planning and Building Control was hoping to work jointly with the scheme sponsors involve development on the Green Belt of a kind for which there is an overwhelming presumption against development; that the site had its Green Belt status confirmed in the adopted local plan, in spite of the efforts of various parties, including EHDC, to redesignate some or all of it for some form of development; and that when the associated proposals on the vacated sites are taken into account, it would involve four major departures from the local plan. The email exchanges with the scheme promoters have plainly ignored this advice in Government guidance. Moreover, EHDC have not dealt with the question about the reliance which property purchasers can place on the local plan in these circumstances. The Council surely has a duty to uphold the plan which it has been directed to adopt. The Freedom of Information Act disclosures reveal that four meetings took place between the Planning Department and the scheme promoters without any record having been made or kept of who attended or what was discussed. Here too, we would have expected the Council to have ensured that such a routine requirement of public administration was uniformly observed. 7. The Council's Code of Conduct for Officers does not appear to give any advice which is relevant to these issues. We therefore conclude that a formal investigation into the propriety of the conduct disclosed in these emails is eminently justified, not least to help officers learn from the experience so that they may have a better understanding of their statutory responsibilities in future. 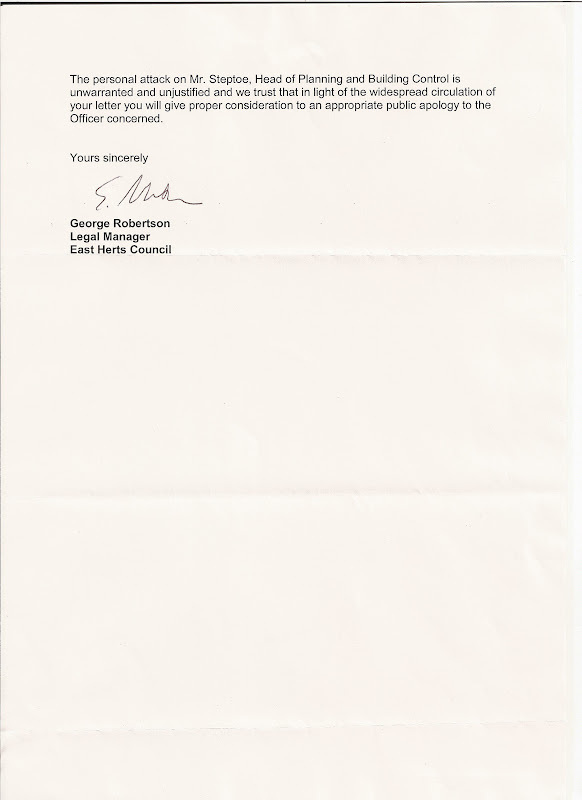 After receiving the above letter of 26 November 2009 from EHDC's Legal Manager, the BSCF wrote to the Local Government Ombudsman. This page was last modified on 9th December, 2009.